Thank you for your interest in Kara Ann Artwork. I thought that it would be helpful if I created a list of “Frequently Asked Questions” regarding my hand-painted aisle runners. Please let me know if you have any further questions. I hope that you find this information helpful! 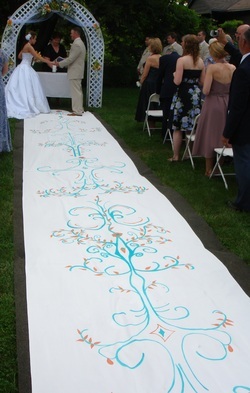 How should I contact you if I am interested in purchasing a hand-painted aisle runner? What is unique about a hand-painted aisle runner? Each aisle runners is created to meet the specific needs of the client. They are hand-painted and are not machine manufactured. I only use high quality fabric runners rather than the typical paper runners. What is the process for the creation of a hand-painted aisle runner? runner. I will send photographs of the runner intermittently to ensure that it is being created to your satisfaction. Upon completion, I will ship the aisle runner to you. How far in advance should I order the aisle runner? The aisle runner should be ordered at least 3 months prior to your wedding to ensure that it is completed and delivered in time for your big day. The earlier that you order the runner, the better. How is the design of the aisle runner chosen? A hand-painted aisle runner is a great way to set the mood at your wedding ceremony! The runner will be designed based upon your specifications and it can be designed to coincide with the style of your ceremony. One idea for choosing the colors for the runner is to use the theme colors of your ceremony (e.g. to match the color of your flowers or bridesmaid dresses). Ideas for the design include: flowers; seasonal designs (e.g. sea shells, leaves, etc); monograms; religious symbols; love quotes; and motifs from your wedding invitations or dress. For example, if you are having a destination wedding in Hawaii, then one possibility is to use tropical colors and flowers. I want to help set the type of ambiance that you have in mind, therefore, the more input that you give me, the better! How much does a hand-painted aisle runner cost? The price for a specially designed custom runner begins at $600 and increases depending on the amount of color and detail of the design. Please let me know about the budget amount that you have allotted for the runner. Then, I can make suggestions that will work within your budget guidelines. The price of the fabric is included in the quote, however, the cost of shipping is not included since it varies. Rush shipping charges are quite expensive for an item of this weight and size, so, I recommend placing your order early in order to avoid them. The down payment includes the cost of the fabric. The price of the fabric varies, depending on the length of the aisle. For example a 4 ft x 60 ft piece of fabric would cost around $175. Upon completion of the runner I will send you a picture of it via e-mail. You will then be asked to send the remaining balance plus shipping charges before the runner is shipped to you. Cashiers or personal checks are accepted. Unfortunately, no credit cards are accepted at this time. Should we set up the aisle runner prior to the ceremony or unroll it during the ceremony? That is a personal preference. One way to keep the runner as clean as possible is to set it up prior to the ceremony and place some ribbon across the end of the aisle to discourage guests from walking on it. The guests can then be seated using the side aisles and the ribbon can be removed when it is time for the wedding procession to begin. Setting the runner up prior to the ceremony seems like the easiest approach. However, we do offer a white braided “pull rope” that can be used to roll out the runner prior to the Bridal Partys’ entrance. A “pull rope” can be purchased for an additional $40. How can I keep the runner from blowing around during an outdoor ceremony? Since the runner consists of relatively heavy fabric, there shouldn’t be too much of a problem if it is windy. However it is best to take precaution. Therefore, I do suggest either placing double-sided tape under the edges of the runner or placing some sort of weight (e.g. paper weights, stone, sea shells, etc.) at various points along the edges of the runner. You can also use landscaping stakes, however, they will penetrate the runner. How can I store my runner after the wedding? Your runner should be wrapped up once the ceremony is over. It is then important to store it in a dry place at room temperature. What can I do with the runner after the ceremony? members. You can also pass the runner amongst your group of friends. Or, pieces of the runner can be framed and given as gifts to family and friends. I am planning on framing parts of my runner for my parents and grandmothers. My Grandmother has been asking me for a piece of our runner since the day of our wedding! Before purchasing an aisle runner, please check with your wedding venue to make sure that they allow the use of aisle runners for ceremonies. Please inform your wedding venue about the length and width of your runner, a few months prior to your ceremony. Doing so will ensure that an adequate amount of space will be left between the seats, for your aisle runner to fit comfortably. In order to help you relax as much as possible on your special day, try to figure out who is going to set up the aisle runner, at least a few weeks before the ceremony. That person will have to be at the venue a little bit ahead of time, to roll out the runner and tape it down if the ceremony is outdoors. It is also important to have someone be in charge of picking up the runner after the ceremony, to ensure that it isn’t misplaced or thrown out. Since you and your family will be zoomed away for photographs after your ceremony, it might be a good idea to ask someone who won’t be getting photographed to take care of it. At one of my friend’s weddings, no one knew if anyone grabbed the runner after the ceremony and the bride was worried throughout her reception. Luckily, her brother-in-law had rolled it up and placed it in his car. Again, please contact me if you have any further questions. I look forward to working with you!! !